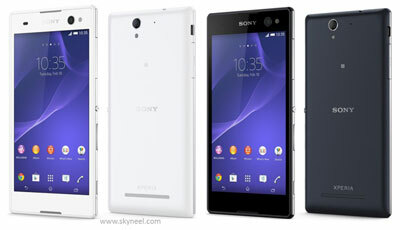 Sony launched its new smartphone Xperia C3 which is the best phone launched for selfie purpose till now. This phone is available in market in Rs. 23.990. The users can get this phone in market from 1st September. The special feature of this phone is its front camera which is very powerful and will be great treat for the selfie lovers. The front camera of this phone is 5 mega pixel, the width of its lens is 25mm. This front camera has soft LED flash. Mostly Smartphone has small angle camera but according to Sony this phone has 80 degree field view which will help to get good photo quality. This front facing camera gives wide angle selfie feature which will make user to click selfie with many people easily. Double tap click and smile shutter type others features also available in this phone. Smile shutter feature can click itself users photo with focusing face of user if you user click on this feature. This phone is specially designed for selfie that’s why its front camera is mainly focused in this phone. This phone has 8 mega pixel rear camera with LED flash. In front and rear camera superior auto, portrait ritch, time shift burst, many kind of picture effect, movie creator, social live, sweep panorama and many other special camera apps are available.For video editing the feature of portrait ritch and picture effect is given and for photo clicking super auto feature and 36 different angle with HDR mode is given. That says that with this phone user can click very stylish selfie in different ways. With the feature of timeshift burst user can click 31 frames in only 2 seconds. This phone has 5.5 inches capacitive touch screen with 720*1280 pixel resolution. Along with it this phone has Triluminos display screen which works on Bravo engine 2 technique. This phone has 1.2GHz quad core Qualcomm Snapdragon processor with 1 GB RAM which will prove good for multitasking. It also has Adreno 305 which will make HD graphics better. This phone runs on latest Android 4.4.2 KitKat. This phone has 8GB internal mermory. The battery of this phone is 2500 mAh. It also gives 24 hrs talktime and 1071 hrs standby time. For connectivity in this phone many options available like 2G, 3G, and 4G LTE. The weight of this phone is 150gm.